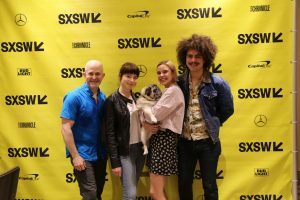 I met with director Carol Brandt, writer/star Meredith Johnston, co-star Rene Cruz, and a cute pug named Chato (along with his human, Harper Robison), all of the new narrative feature Pet Names (which I also reviewed), on Sunday, March 11, at the 2018 SXSW Film Festival. 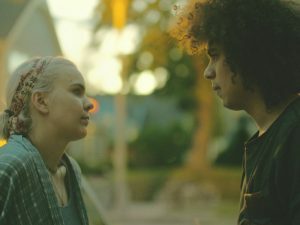 The film tells the fumbling, bittersweet misadventures of Johnston’s Leigh, a twentysomething grad-school dropout taking care of her sick mother, who takes a break from the daily grind to go on a soul-searching camping trip with longtime friend Cam (Cruz) and his trusty canine companion Goose (Chato). Among other things, the movie is noteworthy for the aesthetic choice made by Brandt and her cinematographer Dana Shihadah to shoot the film in the old Academy 4:3 aspect ratio, with very little camera movement, thereby accentuating the claustrophobia of Leigh’s journey of self-discovery. Here is a condensed digest of our conversation, edited for clarity. Hammer to Nail: Hi! So, I understand that you are at SXSW as part of the FILM FATALES collective. Could you describe FILM FATALES, for our readers, and how this movie fits in with them? Carol Brandt: Sure! So, it’s a pretty new organization that started not too long ago. I actually just joined! It provides a great opportunity for female filmmakers to collaborate and support each other. We all share each other’s posts and we try to see each other’s films at festivals and to just be there to provide support. It’s really nice, because you can go to someone’s film and be the one in the audience who asks questions and helps them out that way, too. HtN: Excellent. So, let’s talk about the genesis of the script. Meredith, where did the story come from? Meredith Johnston: So, I think I started writing it back in 2014, and honestly, I don’t really know what the motivation was to write it. It’s my first screenplay, so I wanted to stay true to something that is close to me instead of going into…(laughs)…science-fiction crazy land, or something. I thought I probably wouldn’t know how to do that well. The idea started with the memory of when I was in high school and my mom had spinal meningitis and encephalitis at the same time, so basically her brain swelled up to a crazy size where she wasn’t speaking English anymore. It was a very crazy experience and I ended up having to take care of her for two to three weeks, or maybe a month…I don’t remember…(laughs)…because it was a bit of a dark time. But the thing that I always remember doing when that happened, because it was the first time that I really felt like an adult, was putting on the kimono – the one that is actually in the film – making espresso in the morning, going out and getting the newspaper, and looking around as if I was the man of the house. So that was the first scene that I wrote for the movie. It was a really interesting thing for a young woman to be doing. MJ: (laughs) That’s my idea of how the man of the house would talk. He’s a businessman, he’s trying to get the stocks up…(laughs)…just my vague understanding of what stocks mean. Yeah, so that’s where that comes from. HtN: And, of course, the man of the house would have a pink flamingo. MJ: Oh, most definitely, yeah. HtN: And I’m from Baltimore, where the pink flamingo has additional resonance because of its association with John Waters. HtN: So, Carol, how did you, then, become a part of the story? CB: I had previously worked with Meredith on another feature that she had a role in, and we kept in contact, sent scripts back and forth, and the first script she sent me was Pet Names, with a different title. I read it and loved it, and I think I only had two notes. One of them was pretty substantial…(Meredith laughs)…but it was a couple of back-and-forths and then we ended up shooting draft #4, or something, which was just crazy, because on my last film it was like draft #25…(laughs). So, yeah, it was really interesting to kind of hop into her process and try to create this world around what she had already written, and to try not to deviate too much, because I wanted to stay true to what had already happened, but still kind of put my own mark on it. HtN: So, it was a real collaboration. CB: It really was. Yeah. HtN: What was your process of casting the film? CB: Meredith cast most of the film, actually. HtN: So, how did you find Rene? HtN: So, as a dog person, this is something I think about a lot when I see people working with animals: are you a dog person? You seem like it, on screen. RC: I love dogs! I didn’t grow up with them, though, so I had to try and get to know Chato and get to that comfort level where I felt like I could hold him and walk him. [His handler] Harper was helping me a lot with that, actually, because that is not something you want to look forced, because that can be really distracting. HtN: Absolutely. So, whose idea was it to put a dog in the film? Was that in the script? HtN: No, no! I understand! MJ: Yeah, yeah! So, she was there, pretty much the whole time, and so, just the image of these two kids with this pug dog on a camping trip seemed to make so much sense to me. Because pugs aren’t really natural to camping at all. MJ: And I guess you could say that that is the state that the two main characters are with each other, that they’re not natural with each other, and a pug is like a symbol. (laughs) But they’re just so lovely and a great source of comedy. HtN: Absolutely. So, who found Chato? Was that you, Carol? CB: Yeah. So, I had known Harper for a while. We went to the same film school. HtN: And Harper is Chato’s human. CB: He was going to be “Chato’s assistant,” but he did more than that. (laughs) So, I had known Harper for a while. We had a bunch of mutual friends, and we both make films. Chato had been in a short film I had made, previously, and I knew that he was the exact pug we wanted. HtN: So, Harper, since you are here, as well, did you have any concerns about Chato’s involvement in the film? Harper Robison: No, he pretty much just sits around, and does whatever he wants to do. (laughs) I was excited to go on a trip with him. I’ve never really been on very many trips with him. HtN: Where is that camping location? CB: It’s in a tiny town called Lone Rock, in Wisconsin, and they love it. (laughs) The billboard outside Lone Rock says, “We are the coldest in the nation, with the warmest heart.” As soon as we drove up, we were like, this town is perfect. The campground is owned by this lovely couple, and they were so great to us throughout filming. They would ask if they could mow the lawn, and they would be willing to wait an hour, while we were shooting, before mowing the lawn. All these maintenance things that you have to do in a campground, they would wait until we were done shooting. MJ: And it was Memorial Day weekend, so it was important for them to have the grounds taken care of. CB: But they were so nice. HtN: One more question about casting, is the woman who plays your mom, Meredith, related to you, at all? You really look like you could be from the gene pool. MJ: Isn’t that crazy? No! We’re not related at all. Carol cast her, and then when she came on set, I was just like, she is just like my mom, in personality, as well! So I just called her mom, pretty much the whole time we were shooting. Well, I called her mommy…(everyone laughs)…just to get really creepy. But yeah, she was lovely. Stacy [Parish] is great. HtN: And I really believed that, genetically, this was possible. So often in films you get weird casting where that is not the case. So, Carol, I wanted to talk about the look of the film. You made a choice, with your DP [director of photography], to shoot it in a 4:3 aspect ratio, and you have very little camera movement. HtN: So, it’s a very conscious, deliberate look to the film. Can you talk about your motivations for that? CB: So, the 4:3 was something we wanted to do to create this claustrophobic sense for the characters. A lot of the film takes place within their interpersonal relationship and within their own heads and emotions, so we really didn’t want to show a lot of the world around them. We wanted to stay pretty focused on their own world, because they are both such self-centered people. As far as the shots and the look of the film, the DP, Dana Shihadah, and I, wanted to create this smallness when we did show wide shots. A lot of the film is in close-up, but when we did pull out and show these wide shots, I wanted to have footroom and headroom, so that they felt smaller in the frame, and that we did show a lot of the surroundings when we showed them. So, the scene where she is running by herself in the woods, there’s a lot of headroom in it, or when they’re sitting by this beautiful canyon in the woods, we show a lot of footroom, so you can see the water. It’s a subtle love letter to Wisconsin scenery, because I feel that a lot of people don’t know how beautiful the state is. MJ: Before we shot there, I had no idea! HtN: So, you’re not from Wisconsin? MJ: No. I live in Chicago. I’ve lived in Chicago for 8 years. HtN: And you, Rene, where are you from, originally? RC: I actually grew up in Los Angeles. Interesting place to grow up. Interesting place to be an actor. I like Chicago a lot more. HtN: Well, there’s a lot of great acting, and improv, in Chicago. Are you involved in improv, Meredith? RC: It’s interesting. We had a rapport, but I didn’t know her that well. Actually, I drove to Chicago from Los Angeles and then picked her up for the first weekend of shooting, and then that’s when we really started to get to know each other. (laughs) I think we just played bad music and…a lot of our connection came from talking about things we hate…(laughs)…or talking about things that annoy us, and how to get through the world as artists. I think we connected on that level. And the interesting thing is that we actually shot three scenes, from when they were together in the past, that didn’t make into the film, but we had that context of their relationship and breakup to add that emotional dynamic. And I think that helped me a lot, just know that that material was in there, unspoken, in the actual film. MJ: I think that the interesting thing about Rene and me, starting out, was that we have a lot of the same sensitivities towards people and things. We’re both actors, so we’re obviously very sensitive people…(laughs)…sometimes to a fault, but I think it was sort of an interesting dynamic of getting to know each other, and how that worked in terms of being old lovers, because it’s still that sort of jilted awkwardness that can come with either a lot of familiarity, or faking that you don’t have that sort of familiarity. So, getting to know someone in that way really helped to our benefit. RC: I think it definitely did. MJ: Yeah. In the beginning, it was hard for me not to be just totally mean to him all the time, in every take…(RC and MJ laugh)…I kept having to ask Carol if I was being too mean. HtN: But it kind of works, because out of that, we get a sense, even before we find out all the details, that there is this fraught past, and he’s not just a friend from high school. HtN: Carol, can you talk about how you raised funds for the film? CB: We had all private donors and investors, and all of them were women, which is not something that a lot of people can say. Our producer, Suzanne Jurva, has a lot of connections everywhere. She used to work for DreamWorks. She was in L.A., then moved to Atlanta for a while, so she’s done the thing. 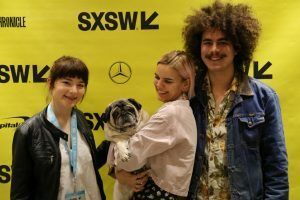 We all call her “film mom,” because she’s definitely taken all of us under her wing and kind of shown us the ropes on how to make a film and how to successfully get it out into the world. So, she had a network in Chicago and Milwaukee that we tapped into for the funding for the film. HtN: So, how did you get in touch with her? CB: I had met her previously. She was a panelist on a test screening of a film of mine. I had never met before, and she came up to me and said that my film reminded her of Kelly Reichardt, and I fell in love immediately. (laughs) ‘Cos Kelly Reichardt is my hero. HtN: Wow! I also really like Kelly Reichardt. CB: She’s amazing! So, that being said, I was like, “Can we get lunch?” (laughs) And we just maintained this relationship, afterwards. And it was not long after I had developed a regular coffee-date schedule with her that she asked if she could produce a film of mine. I was actually gearing myself up to ask her if she would produce a film of mine, so the fact that she asked me was amazing. So, I obviously mentioned that I was in pre-production for this film, and she hopped right on board, read the script and loved the script. I plan to work with her again, hopefully, because she’s incredible. HtN: Yes, mentor-mentee relationships are always so important. I’m a university professor, and we try to facilitate these for our students, as well. So, this is great to hear. Congratulations! I really enjoyed the film. Chato, do you have anything to add?